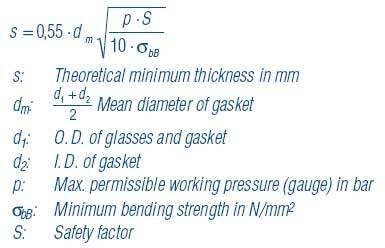 Borosilicate glass, thermally prestressed, optically tested, properties as laid down in DIN and OeNORM. pre-stressing of glasses is not permissible. α20/300 .4.5 .10–6 . K–1, tested to DIN 52328.
tg=550.°C, tested to DIN 52324.
alkali class 2, tested to ISO 675.
hydrolytic class 1, tested ISO 719.
acid class 1, tested to DIN 12116. Sight glasses are packed in individual cardboard boxes. In addition to the glass, each package contains a KLINGER sealing gasket and cushion gasket and forms a complete unit ready for installation. Handy, shock-proof package. 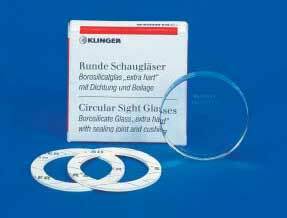 At request we supply circular sight glasses in any desired dimension.